This is one of the easiest salads ever, and it takes 20 minutes to make (including prep). Toss asparagus with 1 tablespoon extra-virgin olive oil, salt and pepper in a roasting pan. Roast in a pre-heated 350 F oven for 10 minutes. Meanwhile, poach an egg. Bring a pot of water to a roiling boil and slip the egg into the water. Lift out with a slotted spoon when egg is done, about 2-3 minutes. 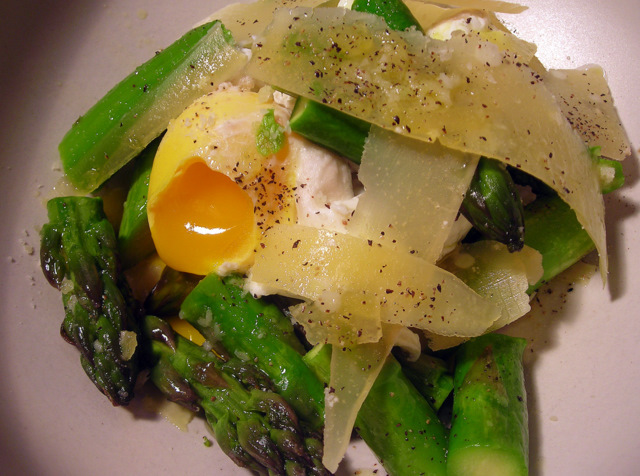 Arrange asparagus onto a salad plate, top with poached egg and shaved Parmesan cheese. Season to taste with sea salt and freshly ground black pepper, then serve at once. 02 May	This entry was published on May 2, 2011 at 9:06 pm. It’s filed under food, general, recipe, spring, vegetarian and tagged asparagus, cheese, egg, salad, vegetarian. Bookmark the permalink. Follow any comments here with the RSS feed for this post. wow. check out those vibrant colours. nice presentation.